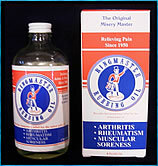 Ringmaster Rubbing Oil was created over 50 years ago as a specialty-premium rub for those people who prefer an alternative pain medication that provides deep penetration for minor aches and pains. Ringmaster is a medicated peanut oil, "a super rub," carefully blended and aged for maximum penetration for stiffness; joint friction from bones rubbing together; tight, sore muscles; and restricted range of movement. All of these problems require a lubricating rub that penetrates, lubricates and medicates without the side-effects sometimes caused by the non-steroidial anti-inflammatory drugs commonly prescribed for arthritis pain. Ringmaster is a multi-purpose pain reliever that can be used for a variety of ailments. It can be applied directly, with hot soaks, and with wraps. Ringmaster provides quick, temporary relief for minor arthritis pain. Other conditions for which Ringmaster provides symptom pain relief. When Ringmaster is applied to the affected area you will feel a warm soothing sensation that penetrates deep into the sore joints and muscles providing quick, long lasting pain relief. Helps with Menstrual and Pre Menstrual problems. We now invite you to join our fast growing national distribution family by becoming a Broker or Wholesaler of the RingMaster product line!